The 2018 Bee Baby is coming. A new year is upon us. Let's look back and see the year in review. January - The year started with some cold temperatures early. The temperatures warmed up nicely late in the month. Not much stress on the colonies. February - The weather was above normal temperatures. There was not much cold weather that can cause widespread starvation. Overwintered colonies were able to start brood rearing with ease. March - Temperature roller coaster. This did cause some late season starvation. There was a good amount of brood going in the hive. A few beekeepers were caught off guard to a cold blast that came from the 10th through the 15th. April - Package bees came. The first delivery was perfect weather. The second delivery was hot and humid on the first day. We had the pallets of bees outside in the shade to keep them cool. Late in the day, the weather turned and the bees were comfortable inside. Warmer than normal first two weeks of the month, cooled off last third of the month. The early warm weather was bring spring on quickly. Overwintered colonies were strong and needing to split soon. May - Bees have been building up nicely. Splits were being made through out the month. Queens were in demand through the month. Some cooler weather put the breaks on the fruit bloom. What earlier looked like an early bloom coming on, became a more average mid May event. A little cooler late in the month held back the Black Locust flow. Black Locust trees normally bloom in late May. The cooler weather kept swarming to a minimum. June: Started with 10 days of very warm weather. Swarming hit big. Brought on by the hot weather. Many beekeepers who did not split their hives saw their bees fly away. Swarm cells were showing up in strong colonies. The Black Locust flow came on stronger than normal. The early hot weather made this a big event. Many beekeepers in southern MN and WI got huge Black Locust crops. Beekeepers that overwintered colonies but did not do spring mite treatments were experiencing hive collapse. Colonies in general were building very well. Package bees were building and expanding into more brood boxes. The mid-June nectar flow was a no show. No nectar flow means more swarm cells. Beekeepers were fighting the swarming impulse. July - The main nectar flow hit around July 4th. About two weeks later than normal. The delay of the nectar flow gave beekeepers with package bees and nucs a little more time for colony build up. Most beekeepers had larger than normal nectar flow with first time beekeepers getting honey in their supers. The Basswood flow was a big help to a big honey crop. There was no Basswood in 2016. Whenever the Basswood flows, the honey crops are usually on the heavier side. August - Cooler than normal weather in August put the brakes on the nectar flow. There was not much increase in colony weight during this month. The nectar flow became more spotty. Some beekeepers still got honey but for most of us, it was over with. Mite treatments were happening from mid August on. The cooler August made it perfect for Formic Acid treatments. Beekeepers were starting to extract their honey crop. The MN State Fair had large participation by beekeepers showing off their honey crops. Beekeeper volunteers kept the honey booth full of knowledgeable docents. Sept - Honey extracting and mite treatment were the monthly chores going on. Some warmer than normal temperatures made Formic Acid treatments a little more challenging. Trying to get days under 85 degrees for three days in a row became a timing issue for Formic Acid treatments. Oct - Beekeepers were finishing up mite treatments and feeding colonies. The warm first half of the month made feeding possible. Late mite treatments were being put on. Too late for many colonies. Some beekeepers were experiencing absconding colonies as high mite loads on untreated or ineffective mite treatments started to take its toll. Beekeepers who treated in August started doing their Oxalic Acid treatments. Oxalic acid was working well and many beekeepers were finding large amounts of dead mites on their screen bottom boards. The late October cooler weather stopped varroa from being transferred from hive to hive. The cold weather kept all the bees at home. Nov - Dec - A little warmer than normal temperatures hit through Nov. and early Dec. Too cool for the bees to fly much, keeping varroa numbers unchanged in most treated colonies. The warmer weather had the bees consuming very little of their winter stores. Colonies looked good going into winter. Hives heavy with honey, Varroa properly treated. Winter covers on, preparing for a big cold spell. Bitter cold in the end of December might take out any colonies weakened by Varroa. Most colonies should be ok. Going into 2018 looks good for many of us. Many beekeepers tried the new Saskatraz queens we were offering. Their claim to fame is good mite tolerance and great overwintering capabilities. Come late February we will see how the Saskatraz queens stacked up. Wendy and I would like to thank all of our customers for another beekeeping season. It is always our goal to help our beekeeping friends be successful in their hobby. What the new year brings, is always different and beekeepers have to roll with the challenges that lie ahead. In about 60 days it will be time to put pollen patties on. We made this video after the first delivery of package bees last April. I finally got around to posting it. It is a good demonstration on how to install bees on a cold morning with no syrup spray. Using a five frame nuc box to start a 2 lb package of bees works great. There is enough room for the bees to fit in the box. The package will not be getting any bigger in population for about four weeks. The bees can keep the five frame nuc box warm, easier than a 10 frame box. The lady in the video, Megan, who helped me install the bees, had just shown up at my shop for some bee supplies for her three lb. package that was coming in a week. She left with her supplies and some good experience about putting package bees in a hive. Wendy and I would like to wish all our beekeeper friends a Merry Christmas and a Happy New Year. Best wishes to you and your family for a bright and prosperous New Year . Cold weather is on our doorstep. It looks like about a fourteen day event. The first week of January look very tough. The weather up to this point has been a cake walk for the bees. The warm late fall has been easy on the bees and on their food supply. Since the first of November, the average hive has consumed around 12 lbs of honey. 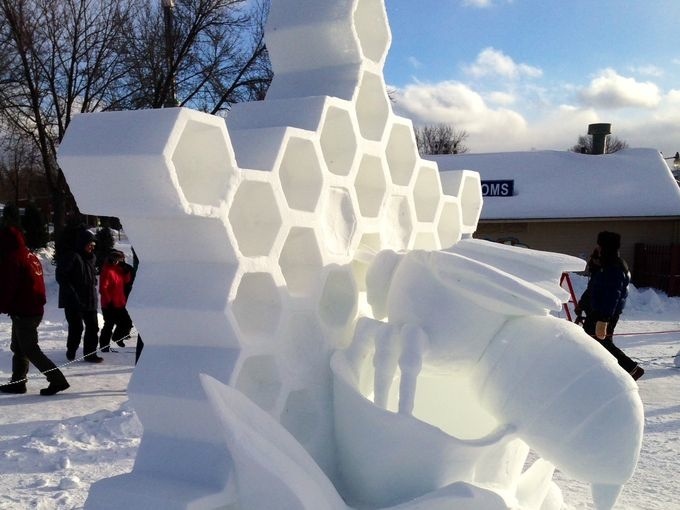 The average hive consumption in winter is around 12 lbs a month. So the bees have not hit their food supply very hard. This cold weather will test colonies. The stresses on a colony in extreme conditions that have been weakened by mites. May result in a less than desirable outcome. 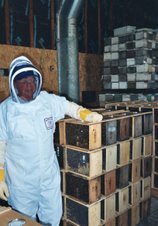 Colonies that a beekeeper managed properly, had low mite counts and ample food stores, is in much better condition to survive the winters of the Upper Midwest. I just received this twitter weather update from MPR. Coldest weather in 22 years coming according to MPR. Other weather models are not saying this. I put up a crank up bird feeder. I have always had trouble with squirrels and an occasional bear on or destroying our bird feeders. This feeder keeps all of the varmints from being on the feeders. The crank up feeder was easy to install. The post is all aluminum and made for outside conditions. The birds love it. Four feeders, offering up a variety of feed. More feeders makes for more birds feeding. If you are a serious bird feeder this feeder may work for you. our new shipment of winter covers have arrived. After enjoying the warm late fall weather, reality hit this morning. Ice and snow. It looks like the snow may be here for the duration. I was able to vaporize and cover all my hives before this weather hit. If you did not get around to covering your hives, now is the time to do it. If winter patties have been on for longer than two weeks, it may be a good idea to go out and take a peek to see if the patties are still there. 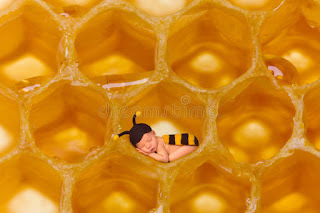 The warmer than normal temperatures had the bees spread throughout the hive. In some cases the bees have been eating the sugar patties. So, check it out, replace as necessary. Now with the colder weather, the bees should stay clustered below the winter patties. If the hive has enough food the bees should be in the box below the top box. The warm weather has been an easy time for the bees. Honey consumption over the last month has been very low. Normally bees eat about 12 lbs of honey per month in the winter months. Over the last month, the honey consumption has probably been around 7 lbs (depending on cluster size). Now beekeepers can take a break. The season is over, the hives are covered and treated for mites. All the bees are ready for the rigors of winter.